The VT750 Shadow Phantom is a completely unique take on the Shadow concept. Take a blacked-out 745cc V-twin engine and black rims sporting matte silver highlights, bobbed fenders, spoke wheels and a beefy front fork, and you’ve got a real head-turner. The deep and throaty exhaust note is hard to miss and irresistible, if nothing else. The most unbelievable part of the Phantom 750 is the price tag, and better yet the mileage, clocking in at an estimated 56 miles per gallon. A whisper holds more power than a ruckus, and that’s most definitely the case with this cruiser motorcycle. Sleeked out and confidence-inspiring, the Phantom 750 includes an all-black engine, frame, rims and handlebar – accented with matte silver highlights. It’s a Shadow custom motorcycle that exudes the ideal of custom cruisers of the past, with the laid-back cool of James Dean. 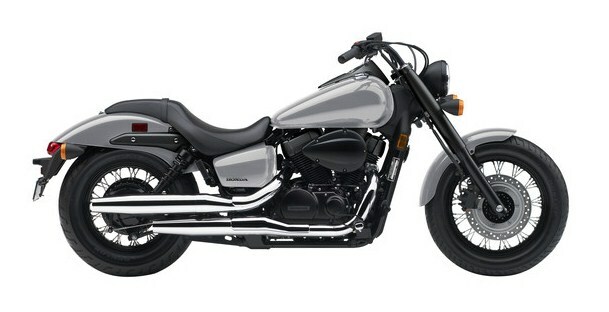 Spoke wheels, sleek pipes with bullet-style mufflers and a minimalist front fender round out the classic look. And at just 25.7 inches, the Phantom 750’s low seat height makes flat-footing it at stoplights or in parking lots a breeze. And the sleek, gunfighter-type seat is comfortable and looks great too. The VT750 Shadow Phantom 745cc V-twin engine features Programmed Fuel Injection (PGM-FI), ensuring easy cold-weather starting and seamless, any-condition fuel delivery. Its three-valve/dual-plug combustion chamber construction serves up massive low-, mid-, and top-end muscle, while burning cleaner. The Phantom 750 is another great example of the technology Honda brings to the Shadow Custom motorcycle line.